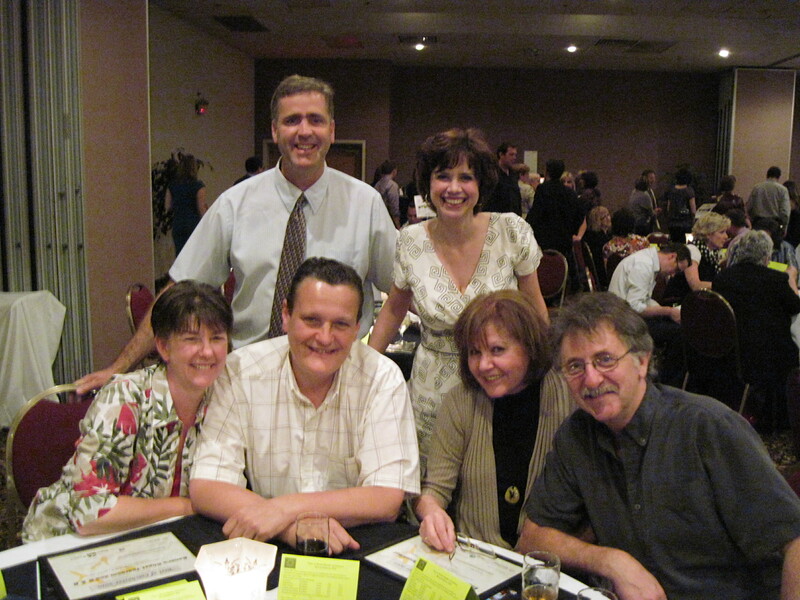 D'Arcy & I with our B&B friends, Nelly & Maarten, Janice & Donnie at the 2010 Best of Colchester Awards sponsored by the Truro & District Chamber of Commerce. The Truro & District Chamber of Commerce held their first annual “Best of Colchester County Awards Gala” on Thursday. We had been nominated in the “Best B&B” category and were notified a couple of weeks ago that we had made the top three finalists along with our friends from Baker’s Chest B&B and Eagle’s Landing B&amp;Bafter a period of on-line voting took place. The actual event had 250 people from various businesses in the region in attendance and was very well done! They announced the winners of the 25 categories in alphabetical order, meaning Best B&amp;B was the third award given out. We all went to the front and received a certificate, congratulating us for making the top three, and then they announced the winner as Belgravia Bed &amp; Breakfast! We were so honored to receive this accolade! In our acceptance speech, we thanked the other B&B’s and mentioned the fact that we all work together so well. We email one another each morning in the summer, and send guests along if we are full and they have vacancy; we really believe that by working together we provide a better experience for our guests! We also are thankful to our family, as without their help, we also wouldn’t be able to provide the experience we do. Watch recorded broadcast from on the topic: Best of Colchester 2010 Business Awards (at Vpype Broadcaster). A few seconds of fame! When I attended the recent TIANS AGM in Digby, I was given an opportunity to be interviewed on the topic of how a Convention Centre in Halifax might impact Tourism around the Province of Nova Scotia. Since one third of our off-season visitors this year came to stay with us either pre or post convention, it is an initiative we strongly support. Just last week, we had a couple from Alberta staying with us after attending a medical convention. They told us that had they not been coming to Nova Scotia for that reason, they would not otherwise have chosen to visit Nova Scotia this year. On top of that, they loved it here so much, they are going to come back next year to see more of the Province! Pour egg mixture over dry ingredients and stir to moisten. Fold in rhubarb. Sprinkle tops with sugar before baking. Bake at 375*F for 20 minutes. * Variation: Instead of sprinkling sugar on muffins before baking, dip tops of warm muffins in sugar after baking. ** This is a versatile muffin – any other fruit in season are just as delicious! We’ve made them with strawberries, raspberries, peaches, blueberries, etc. Just a reminder that today (June 3rd) is the last day to vote for us as “Best B&B” in the Truro & District Chamber of Commerce’s “Best of Colchester County” contest. To vote for us, The Belgravia Bed & Breakfast, please click here! We’ve been nominated in the “Best B&B” category of the Truro & District Chamber of Commerce’s “Best of Colchester County” contest. This people’s choice awards event recognizes the outstanding achievements of local businesses during the 2009/2010 calendar year. The Best of Colchester Awards Gala will highlight community favorites in twenty-five (25) business categories, using an online voting system to determine the winner in each award category. Voting has been taking place from May 20th and ends tomorrow, June 3rd. At the end of the voting period, the Chamber will be announcing the top three vote-getters in each category, with the winner in each category being announced at the Best of Colchester Awards Gala on June 17th. To vote, please click on the following link: Best of Colchester Awards and Belgravia Bed & Breakfast is listed under the “Best B&B” Category! Thank you for your support; we are among some tough competition! We’ll let you know how it goes! Welcome back Salad Bowl Gardens! We are so excited to be welcoming Roxanne, Jamey & Oliver, our friends from Salad Bowl Gardens back today! Each Tuesday from now until the end of September, they deliver fresh organic produce to the 30 shareholders of their Community Supported Agriculture initiative from our driveway. This is our second year being a part of Salad Bowl Gardens and are looking forward to receiving our bag today, filled with spicy salad mix, Arugula, Spinach, Radishes, Edible Flowers, a large bunch of Rhubarb and farm-fresh eggs! Roxanne also made jars of Rhubarb-Orange Chutney – yum! I think Eggs Florentine will be on the breakfast menu tomorrow!